Though you would never guess it from the paucity of coverage in the major news media, there is a fierce persecution of Christians going on in the Middle East. In Egypt, convents and churches are being burned to the ground and Copts, members of one of the most ancient Christian communities, are being routinely harassed, tortured, and arrested. In Iraq, the ISIS group, hoping to re-establish a “caliphate” across the northern sector of the Middle East, is brutally persecuting Christians. Just recently, an ultimatum was issued in Mosul, where Christians have been living for over 1,600 years, that believers in Jesus have to pay a stiff fine, leave the country, or be put to death. And the sheer shock of these extreme instances can allow us to overlook the fact that in Saudi Arabia Christians are not permitted to build churches or to practice their faith publicly in any way. Moreover, Muslim persecution of Christianity is not limited to the Middle East. Islamist radicals have been attacking Christians in Indonesia, India, and Philippines for quite some time. And perhaps the most extreme examples of this persecution are the attacks launched by the Islamist group Boko Haram in Nigeria. This terrorist sect has burned churches, wantonly killed innocent Christians at worship, and most recently, kidnapped hundreds of Christian girls whose crime was attending school. It is easy enough to condemn these actions as deeply inhumane, but I would like to press the critique a bit further, drawing attention to the work of Pope Francis’s two immediate predecessors. 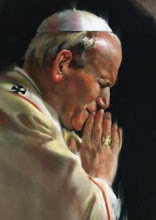 Pope John Paul II was the most vocal defender of human rights in the 20th century. Across the world and in hundreds of different venues, he insisted that the respect for fundamental human rights must be the key to a just political order. And of all the human rights—to life, liberty, a just wage, access to the ballot—the most basic, he taught, was the right to religious freedom. This is because the spiritual aspiration of the human heart is what defines us as human beings. The violation of that most sacred of “spaces” is, therefore, the most offensive, the most heinous and de-humanizing. To use the threat of force to compel someone to change his religious beliefs—which we are regularly seeing in the Middle East—is not only criminal but wicked. However, in Muslim teaching, Allah’s nature is so transcendent that it goes beyond any and all categories, including that of reason. Pope Benedict cites the noted French Islamic scholar R. Arnaldez, who points out that Allah is not even bound by his own word, so that if he so chose, he could recommend idolatry as morally praiseworthy. This elevation of the divine will over the divine mind, called “voluntarism” in the West, is, for Benedict, the source of enormous confusion and mischief. Most notably and dangerously, it opens the door to the idea of divinely sanctioned violence. Now I fully realize that many Christians over the centuries have done terrible things in the name of God and that the overwhelming majority of Muslims are peaceful and non-violent. But I think it is clear that when Christians act in such a way, they are unequivocally at odds with their own conception of God. Is the same true of Muslims? I am still waiting for a compelling answer from the Muslim camp to the question posed eight years ago by Pope Benedict. At the time, of course, Islamist radicals responded by killing a number of innocent Christians – certainly a curious way of refuting the notion that divinely sanctioned violence is irrational! In the meantime, I believe that all people of good will ought to pray for both the victims and their persecutors, for the best way to honor God is through an act of compassion. The same God who is identified with Logos is, according to the first letter of John, also identified with Love.